Need a certified birth certificate? FastBirthCertificates helps you quickly and easily order your birth certificate online. Get started for $39.95. Complete our short, simple web form, and submit your payment securely. No confusing government forms, documents or paperwork! Sometimes, the issuing government office requires a signature. Just sign and date the documents we send you. We make this process dead simple. Your official, government certified birth certificate will be mailed directly to you by the issuing government office. Simple as that! Faster processing: We file directly with processing agencies, which saves you wait time and expedites the ordering process. Error checking and review: Our experts review each order to ensure smooth, efficient processing. Trackable ordering and shipping: Most orders can be tracked, and we respond quickly to all status update requests to guarantee timeliness. Processing updates: We will keep you posted on your order’s progress throughout the process. With us, there’s no hassle. We make it fast, easy, and painless for you to order birth certificate online. You get the picture. Trusted by thousands, FastBirthCertificates.com is your online resource to order birth certificates in a safe, secure, and private environment. FastBirthCertificates.com is a private birth certificate expediting service and not a government agency. We make the birth certificate ordering process fast and easy. Our goal is to help you avoid government paperwork, long wait times, and the hassle and pain that comes with ordering a birth certificate through the state. Your order will be error-checked, filed with the appropriate agency, and expedited to you. You can obtain a birth certificate from your state with reduced fees, but you will not receive expedited processing or expert review. You can find a list of self-serve agencies by state by visiting http://www.cdc.gov/nchs/w2w.htm. There are several ways to obtain a new birth certificate, but when you order your birth certificate with FastBirthCertificates.com your request is reviewed by experts and checked for errors before it is filed. This not only hastens the process of getting your birth certificate but also saves you the potential time and frustration of re-filing documents through the mail. Our fully online service is safe, user friendly, and extremely efficient. Just fill out our online order form and answer all the questions to the best of your ability; we’ll file paperwork with the appropriate agency on your behalf and monitor your order for you until it is fulfilled. Replacing vital documents can be a huge hassle, especially through traditional mail. You can obtain a birth certificate through the local government in your place of birth, but the hall of records or county clerk in your hometown may not be able to provide expedited service or shipping if you need your birth certificate in a hurry. That’s why it’s simpler and ultimately more cost effective to order your birth certificate online with FastBirthCertificates.com; we’re not a government agency, so we work quickly to make sure our customers get what they need, when they need it. When you obtain a birth certificate from a government agency by mail, you’ll have to correctly fill out several documents and mail them with a notarized sworn statement and a check to pay the copy fee. There’s no way to check the process of your order, and long delays in processing requests are not uncommon. 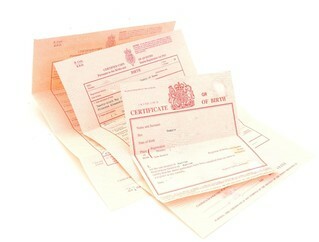 With FastBirthCertificates.com, you don’t need to worry about dealing with county bureaucrats and old-fashioned mail. It’s never been easier to order a birth certificate online, and we offer immediate processing options if you need your vital documents quickly. Our order form walks you through the necessary steps and requirements for your state, and our live experts double check every aspect of your birth certificate order for errors and inconsistencies. Ready to Order a Birth Certificate? See why thousands use our streamlined, simple process!